Detective Isaac Bell returns, in the remarkable new adventure from the #1 New York Times-bestselling author. 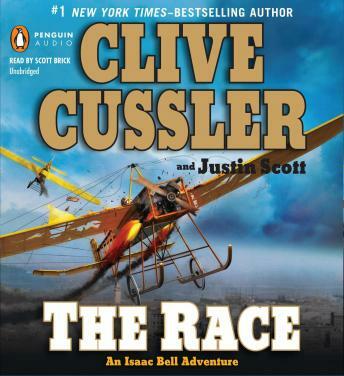 It is 1910, the age of flying machines is still in its infancy, and newspaper publisher Preston Whiteway is offering $50,000 for the first daring aviator to cross America in less than fifty days. He is even sponsoring one of the prime candidates-an intrepid woman named Josephine Frost-and that's where Bell, chief investigator for the Van Dorn Detective Agency, comes in. Frost's violent-tempered husband has just killed her lover and tried to kill her, and he is bound to make another attempt. Bell has tangled with Harry Frost before; he knows that the man has made his millions leading gangs of thieves, murderers, and thugs in every city across the country. He also knows that Frost won't be only after his wife, but after Whiteway as well. And if Bell takes the case . . . Frost will be after him, too.